It's a building site! Mr Singh next door was unable to tell me more, i.e. if it will be a pub again. 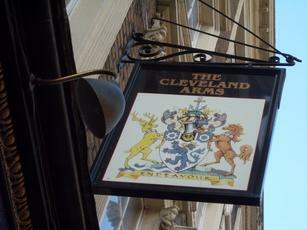 The Cleveland Arms is under new management. The hops, pool table and dart board have been removed, and the walls have been painted a steely blue. In many ways it is an improvement, but the staff seems to be changing on a weekly basis, - and while they are an attractive young bunch they are inexperienced. You can buy a plate of charcuterie or smoked salmon, with a few hunks of bread with no change for a tenner. IPA has remained at a reasonable price, but all other beers are pricey. Also one pound -fifty for a weak lime and soda is exorbitant in my book. 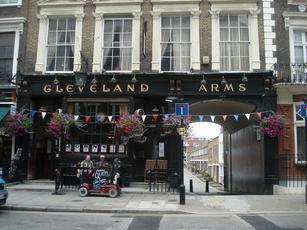 It's an attractive Victorian back street boozer and has been a friendly local for the Bayswater community for many years. In it's present form it is slightly pretentious, soulless, and a bit of a rip off, which is unfortunate. It's been a while since I've ventured into paddington and after a rough day popped back to one of my favourite pubs. Well it was an award winning ale pub with enough quirk to make it interesting, a bunch of locals who were always fun and staff who were happy to chat and give a little more than dump a pint in front of you. All change! Soulless place now, hardly busy, think they call it a "pop up pub" it's all wrong, the staff poured me a pint and took my money. There the interaction ended. And £4.20 a pint for what was an averagely kept bitter? No wonder the gaff was quiet!